Members of Royal Canadian Legion, Grand Bend, Ontario. Photo by CaseyLessard. Creative Commons License. Declining membership rates, halting revenue and the sale of historic buildings. The media’s focus on Remembrance Day has brought the struggling state of Royal Canadian Legion membership into the light once again. 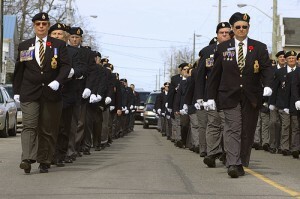 Ontario Legion membership has declined almost 15% in the past 5 years and many previously vibrant branches have closed their doors or relocated to more affordable locations. This decline in Legion membership can be at least partially attributed to the aging World War II and Korean War veterans. Many older veterans have passing away and there simply is not the same number of new veterans. However, veterans from recent wars are simply not flocking to their local Legion like their predecessors did. This decrease in membership isn’t unique to the Legion. Many service clubs such as the Lions Club, Orange Lodge, Elks, Kiwanis etc have all seen a similar decline. Each of these service organizations has a unique history. However, service club membership as a whole has tended to wax and wane based on political, economic and social conditions of the era. Many male dominated service clubs were initially established under fraternity style ‘brotherhoods’. Perhaps the most well-known fraternity of this style is the Masons, which have been depicted in novels, on the Simpsons, and everything in between. These fraternity lodges and clubs all included elements which emphasized ritual, secrecy and accomplishment. Many of these organizations incorporated regalia, pledges and membership levels into their rules. Orange Lodge Regalia, Grand Orange Lodge of Ontario West Museum. Photograph by antefixus21. Creative Commons License. In the 1920s these fraternal organizations began to transform into increasingly more modern service based organizations. This marked a movement away from ritualistic proceedings and a step toward focus on social ideals. This also impacted the membership base of the clubs. Under the fraternal model profession and class mattered less than active participation. With the introduction of service based clubs which emphasized networking, class and professional status became essential parts of membership requirements. For example, Rotary Clubs still require new memberships to be sponsored by an existing member and “must hold or be retired from professional, proprietary, executive, managerial, or community position”. This employment requirement makes it almost impossible for a working class individual to become a Rotarian. Service clubs have often acted as exclusive business networks which provided advantages to their memberships. As a result, from the 1960s -1970s clubs such as Rotary and the Lions were subject to considerable criticism for their ‘insider’ business tactics. To avoid criticism many clubs emphasized charitable community service as being their primary function not business networking. 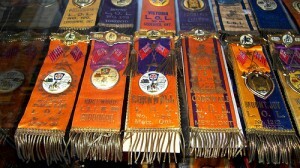 Since the 1980s service clubs have been seeing a steady decline in membership and participation. The decline might partially be attributed to changing social realities and evolving definitions of what is socially acceptable. A number of these fraternities or social clubs were founded on principles that many people consider offensive today. For example, the Orange Lodge originally dedicated a significant amount of its time attempting to root out Catholicism and the Odd Fellows initially excluded all women, persons of non-white ancestry, those afflicted with a chronic disease, the blind, and the poor. Service clubs are now open to women and minorities, though this may be partially due to a number of lawsuits and equal rights legislation. Many clubs have created separate organizations specifically for women which meet separately to their male counterparts. The majority of service club membership still tends to be well off white males. Today, many service clubs perform charity work and provide community services on a regular basis. For example, the Elks of Canada provide support to children with hearing impairments via their Elks and Royal Purple Fund for Children charity and the Kiwanis Foundation of Canada provides a number of education and training support programs. Despite these great charitable endeavors membership numbers continue to drop. Do service clubs still have a place in today’s society? Many people rely on the charities established by service clubs and many small towns still use the Legions and Orange Halls as community gathering places. However, many people are seemingly less interested in joining structured service clubs and prefer unstructured volunteerism. Many service clubs have weathered the Great Depression, political upheaval and tremendous social change. It will be interesting to see if the clubs continue to persevere in a world that is filled with a multitude of options, charities, and community interests. Krista McCracken is the Archives Technician at Algoma University’s Shingwauk Residential Schools Centre, she is a co-editor at Active History. The problem is many of these service groups meet during the day when people are at work. Younger people are not that concerned with meeting rules or inner politics that is in many of these groups. It is easier for younger people to volunteer at churches or their children’s schools or sports teams.